2. Scrub and dry the potatoes and slice them into 1/2 inch slices. 3. Combine the butter and garlic in a bowl, then toss the potato slices until they are completely covered. 4. Lay them out in a single layer on the baking sheet, and then place them on the top rack of your oven. 5. Broil for 6-8 minutes, turn them over and broil for another 6-8 minutes. They will be golden brown and tender when pierced with a knife. 6. 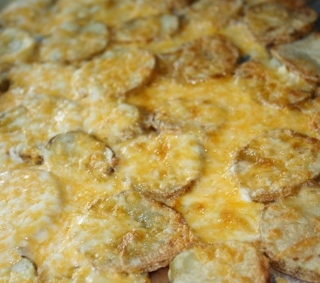 Sprinkle the cheese evenly over slices. Broil a couple minutes more until the cheese is melted.